Hello, I'm Teacher Aidel. Welcome to AQUA English School. I have been teaching for quite a long time and I can say that teaching can be so overwhelming at times. I enjoy the fact that I get to experience different things with new challenges and meeting students from all walks of life. Everyday is an opportunity to share knowledge, learn something new and prepare students to become competitive English speakers now and in the future. Come and have fun learning English with us and your friends! Hello Everyone ! I am Teacher MAricel of AQUA English School.I have been teaching for quite a long time. It's my pleasure to share my skills and knowledge. Here in AQUA English School, we help our students improve their four macroskills in English. These involve their speaking,writing,listening and reading skills. In addition, we help our students improve their social skills by exposing themselves in an educational trip or in any indoor and outdoor activities.Everyone, Welcome to AQUA English School.Let's have fun learning English. Happy You! Happy Me! Happy Us! I'm teacher Helen. I love teaching. I love English. I love teaching English to students who want to learn. I have been teaching English to students from different countries for specially Japanese children a long time and I learned a lot from them. I want to impart my knowledge to my students in AQUA and help them become one of the competent English speakers someday. I believe that Learning in a fun way is one of the ways to learn fast. So I'm looking forward to having a fun class with you someday! Hello! I'm Teacher Edo. 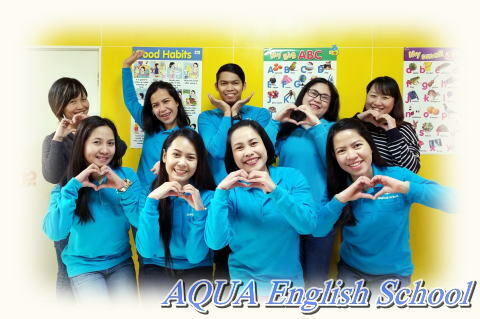 You are always welcome to Aqua English School where learning English is fun. Our teachers are very passionate about their students' welfare and learning progress. Come, visit and try our different programs. You will surely be able to practice English enthusiastically and speak it confidently. Hello! I'm Teacher Athena and I am one of the teachers of AQUA. Here, we just don't teach English. We make sure to make a positive impact and inspire students. I would be happy to impart my skills to give the students tools to support their need to grow. Thank you and see you here in AQUA. Hello! I'm Teacher Aiza. Welcome to AQUA English School. I have been teaching for a quite long time and I can say that teaching can be so exciting. Here in AQUA, aside from teaching English, we also make sure to create a positive impact to the students, provides a friendly environment and to have an enjoy able way of learning. Come and visit our school. We would be very glad to welcome you. Hi! I am Teacher Love. Learning English is fun and I will make sure that there is passion and commitment in teaching with positive atmosphere in the classroom. I will surely walk this journey with you. Let us continue to achieve your dreams and remember to believe in yourself, for you are stronger than you know. Let us fill our hearts with joy, laughter and smile as you learn English. copyright©2015 AQUA English School all rights reserved.